Outhouse Rag: Must Have GIZMOS editors’ review: Spracht Aura Mobile BT – Conference on the go! Must Have GIZMOS editors’ review: Spracht Aura Mobile BT – Conference on the go! 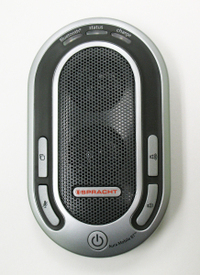 What’s good: The Spracht Aura Mobile BT is the ultimate multifunctional Bluetooth speakerphone. It can be used as a Bluetooth speakerphone with your cell phone, with your computer for VoIP calls, or with your regular cordless phone handset. It also has an excellent sound quality with noise-reduction and echo-cancellation features with a full 3 watt amplifier generating 95 dB of digital sound. What’s bad: You can't make calls from the speakerphone, and only allows one pairing at a time. What’s the bottom line: Excellent clear sound quality with the ability to be used in the car as a hands-free device or in the office/home as a speakerphone for conference calls. Also compatible with Skype, Yahoo Messenger, Windows Messenger, and all other VoIP phones. I found most attractive with the Aura Mobile BT is that it operates in full duplex transmission mode, meaning it offers simultaneous two way communication with echo and noise cancellation technology provided by SoundClear™ Digital Signal Processing (DSP) chip. Very nice! Design: The Aura Mobile BT oval in design and measures 5.5 inches long by 3.1 inches wide by 1 inch thick, and weighing in at about 9 ounces. It’s not small but I do not believe that it should be. More on that later. The Aura Mobile BT comes in a matte silver and dull gray color scheme housed in plastic oval casing with a large perforated speaker grille which is aesthetically pleasing to the eye. Above the speaker grill the Aura Mobile BT has three LED lights signifying Bluetooth (flashes green and amber when pairing and blue when paired), Status (flashes green when on and rapid green flashing when in mute mode), and Charge (amber when charging, when batter is low it flashes, and goes dark when charge is complete). The Aura Mobile BT is very simple to use and only requires 5 rubberized buttons which surrounds the main speaker. The buttons are raised above the surface making them easy to find by feel without having to take your eyes of the road. Starting on the left of the speaker grill and working to the right side are as follows: 1) Bluetooth Mode pairing, 2) Microphone Mute, 3) Power on/off, 4), Volume Down and 5) Volume Up. Each button is easily identifiable by their markings. 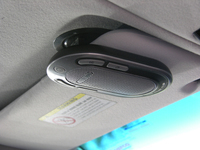 On the back of the device is a clever built-in sun visor clip for your car. When not in use it fits flat to the device so it does not add to the size of the casing. The backing also has a printed quick start guide. In the Box: Spracht Aura Mobile BT Bluetooth speakerphone devise, in-car power and charger, in-home wall power and charger, external microphone cable with 2.5 mm jack, visor clip, VoIP cable with 2.5 mm/3.5 mm jack, user's manual, and a quick start guide. Performance: I’ve tested the Aura Mobile BT in my car with the sunroof open and closed over a course of a month as well as using the device in a hotel room as a conference call device while traveling. In terms of general performance, the Aura Mobile BT was very impressive and very easy to use. You can answer and end calls from the unit, outgoing calls must be dialed from your cell phone. The sound from the duel speaker system is excellent and very loud when needed. The sound quality far exceeds my own cell phone speakerphone capabilities due to the echo and noise cancellation technology provided by SoundClear™ Digital Signal Processing (DSP) chip. Because of the full duplex transmission simultaneous two way communication as if you are talking on your cell phone. While driving in your car the built-in sun visor clip worked perfectly; rarely the person on the other end knows that they are on the speakerphone. When driving with the sunroof and windows open I would recommend using the external microphone clipped on your shirt, by the way the external microphone also has the built-in echo and noise cancellation technology as well. The only issue I had, which is not a major due to that fact the pairing the device is so quick and easy, is that you have to pair the Aura Mobile BT with one cell phone at a time. The reason for the size? Performance of the dual speakers which produces 3 watts of digital sound with echo and noise cancellation technology. The best sound I’ve experienced with any Bluetooth device. What’s Missing: I would like to see it come with a iPod cable for the use in my office. Cost: You can buy the Aura Mobile BT with shipping from the manufacture at www.Spracht.com for $129.95 USD.